Another year is coming to an end and I am doing a review of which goals I have managed to achieve. In 2015 I have spoken at 14 different conferences, making 34 presentations & 2 precons that were spread over 12 months and were ranging from online webinars for a couple of enthusiasts to the PASS Summit 2015 – the biggest Microsoft Data Platform event. From the 14 conferences where I have spoken there were 6 different SQLSaturdays, but there were many more different types conferences around the world including some major conferences in Portugal, Belgium, Slovenia and in Germany. I have spoken more frequently then before for the user groups with examples of Data Platform User Groups in Lisbon, Porto & Coimbra, .NET User Group in Lisbon, Data Platform User Group in Munich. I have attended 15 User Group meetings in 2014, and in 2015 I have managed to make 16 but it was more spread over 5 different user groups, including the first user group meeting outside of Portugal. Also, I have giving more online webcasts with examples of InMemory PASS Virtual Chapter, SQLSentry Webinar & 24 Hours of PASS Portuguese Language. 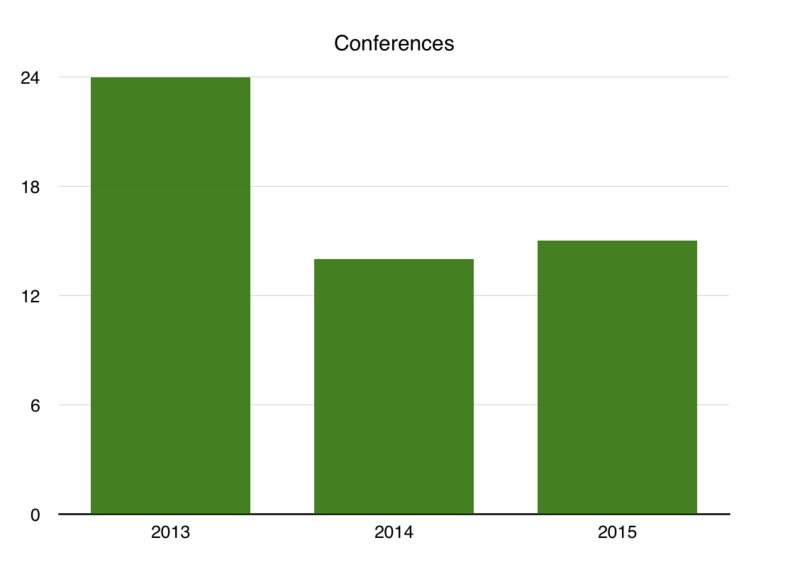 Comparing 15 conferences I have attended in 2015 (14 speaking + MVP Summit) to the 14 conferences in 2014, I have definitely failed to decrease the overall number of conferences and that makes me want to lower the number of conferences in 2016. 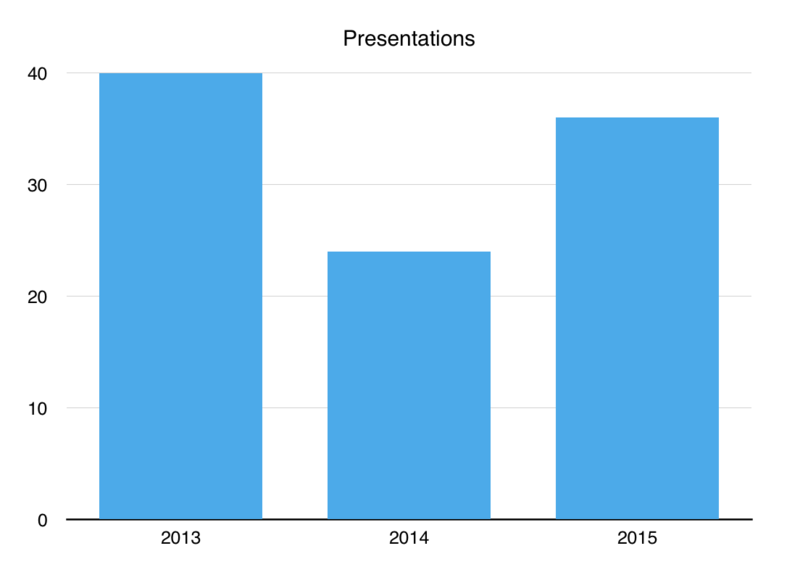 I have given 34 presentations & 2 precons in 2015 while in 2014 the numbers were 22 and 2 respectively. This means that I have spoken 50% more in 2015 then in 2014, while attending 1 conference more in total. Being more efficient makes me happy, but not being able to decrease the number of conferences leaves me wishing to exercise better control over myself in 2016. In 2016 I am making a hard stop on the amount of my travel and I am intending to speak on very few conferences, spending more time with my family at home. I am already committed to speak at SQLKonferenz in Germany in February, SQLBits in Liverpool in May and if I am selected, then PASS Summit 2016. I will be giving more online webinars and I am definitely giving at least the same amount of attention to the local user groups in my home country. I hope to arrive to the end of the 2016 being able to say that I was travelling less. Making a review of my blogging activities in 2015 I have discovered that I have published 61 blog posts in 2015, while in the year 2014 there were in total 78 entries. The more important metric for me personally is to continue writing and challenging myself, with at least 1 blog post per week and 61 blog post is making me feel that I have managed to complete the mission I set myself on. After a lot of delay, I have managed to launch CISL (The Columnstore Indexes Scripts Library) on the 1st of September 2015 and this is definitely an important mark for me. The important version 1.1 should go live in the next days … I am looking forward to discover the reactions of those who will be using it.